KABUL, Afghanistan -- A more hopeful outlook for Afghan democracy is the key reason the Obama administration is considering slowing down its troop withdrawal and rethinking the scope of its counterterrorism mission here, Defense Secretary Ash Carter said Saturday. No decisions have been made, but President Barack Obama will discuss a range of options for slowing the U.S. military exit when Afghan President Ashraf Ghani visits the White House next month, Carter said at a joint news conference with Ghani at the Presidential Palace. The "common denominator" in the new thinking about the U.S. military mission is a belief in Washington that the formation of a unity government in Kabul last year has opened new possibilities for progress not only on the political front but also in the security arena, Carter said. He said the unity government of Ashraf and Chief Executive Abdullah Abdullah offers new promise for a more effective partnership with Washington in stabilizing the country. 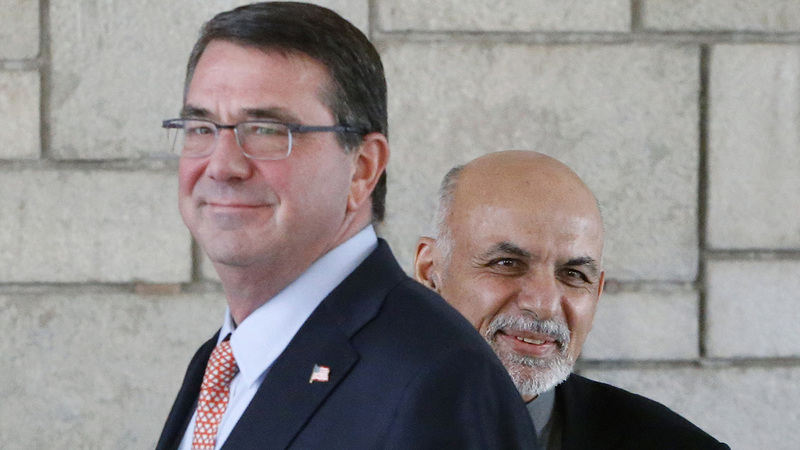 U.S. officials grew impatient with former President Hamid Karzai, who sometimes publicly criticized the U.S. military and took a dimmer view of partnering with the U.S.
"That's a major change," Carter said, "... that just a few months ago we couldn't have planned on." Obama's current plan calls for troop levels to be cut in half from the present 10,000 by the end of this year and reduced to nearly zero by the end of 2016, while maintaining a security cooperation office in Kabul. Ghani has made it known he thinks that should be slowed down in order to better support Afghan forces battling a resilient Taliban insurgency. Carter did not describe in detail what changes Obama is considering in the U.S. military presence in Afghanistan, but he said it could include slowing the pace of the withdrawal as well as changing the timing and sequencing of U.S. base closures in the country. He said Obama also is "rethinking the details" of the U.S. counterterrorism mission in Afghanistan, where there are still remnants of al-Qaida as well as signs that the Islamic State militant group is seeking to make inroads here in addition to Iraq and Syria. In his remarks to reporters, Ghani thanked Obama for being flexible and showing a willingness to consider "the realities on the ground" as he rethinks the drawdown schedule. Using a similar phraseology, Carter said that when he returns to Washington he will formulate recommendations to Obama in advance of the March summit that "reflect reality on the ground." Carter lauded the progress that Afghanistan has made during the 13 years since U.S. forces invaded and toppled the Taliban regime. Obama's goal, he said, is to "make sure this progress sticks" so that Afghanistan does not again become a launching pad for terrorist attacks on the U.S.
Carter also met in Kabul with Gen. John Campbell, the top U.S. commander in Afghanistan, and Gen. Lloyd Austin, the commander of Central Command, which has responsibility not only for U.S. operations in Afghanistan but across the greater Middle East.